One of the things I do each day is check my eBay searches (now using the new feed as well) to see what Timpo goodies are up for sale. Uber vintage plastic collectors are probably frowning already …. Not another article on Timpo again …… well I have some sympathy but for me Timpo remains the maker that I love the most and takes me back to childhood ( along with Airfix ) so here is a look at mismoulds variants, conversions and copies. Well the Black knight with Blue Eagle dropped off the radar just as quickly as it was originally listed. I later found out through a chat with the seller that it had sold privately for a 4 figure sum . Other figures like this exist in very small numbers and when they pop up they are snapped up by collectors pretty quickly. Perhaps an alternative to the rare variants is to look out for a factory error figure that itself will be slightly different to the pack. 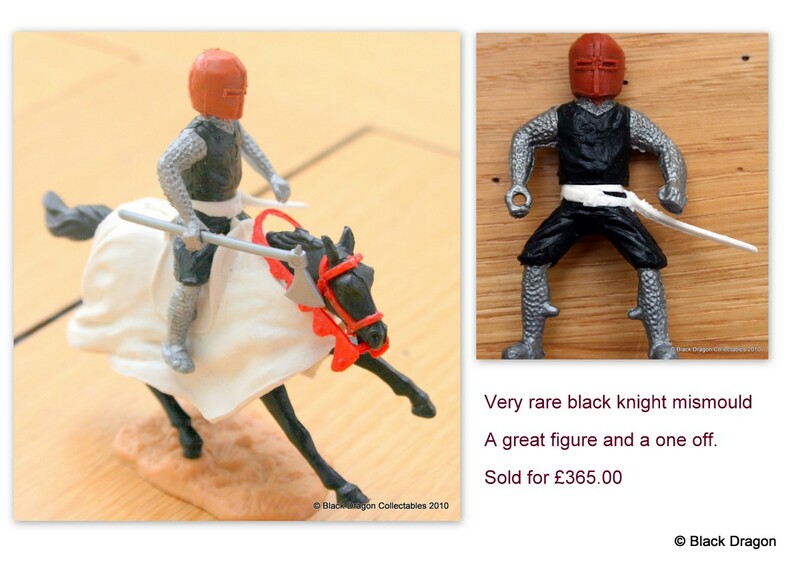 A few years ago I had the good fortune to find one of these knight figures without an eagle. With some ignorance I thought this must be unique but later found out from Timpo folk far more qualified than I that this was fairly common and most serious collectors have a few like this in their collections. In my one the cavity that took the moulded eagle colour had been filled with the main body colour. This wasn’t intentional or at least I don’t think it was but it did get a lot of attention and sold for a tidy sum to one of our German friends. A bit later as part of a deal for a friend I picked up a crusader body in just the same condition which again I sold on for a good pice. 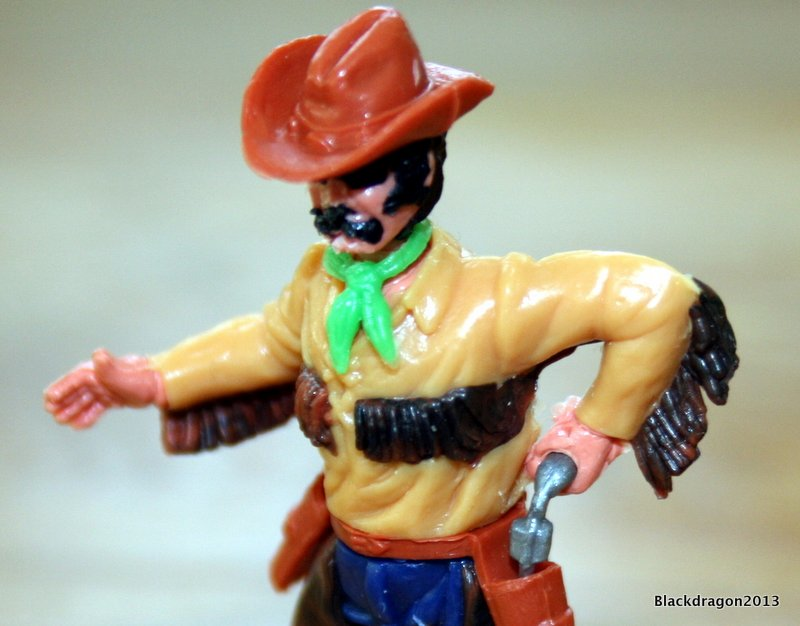 I’m sure most have seen a 4th series Cowboy with deformed whiskers or beard caused by a problem with the over moulding. 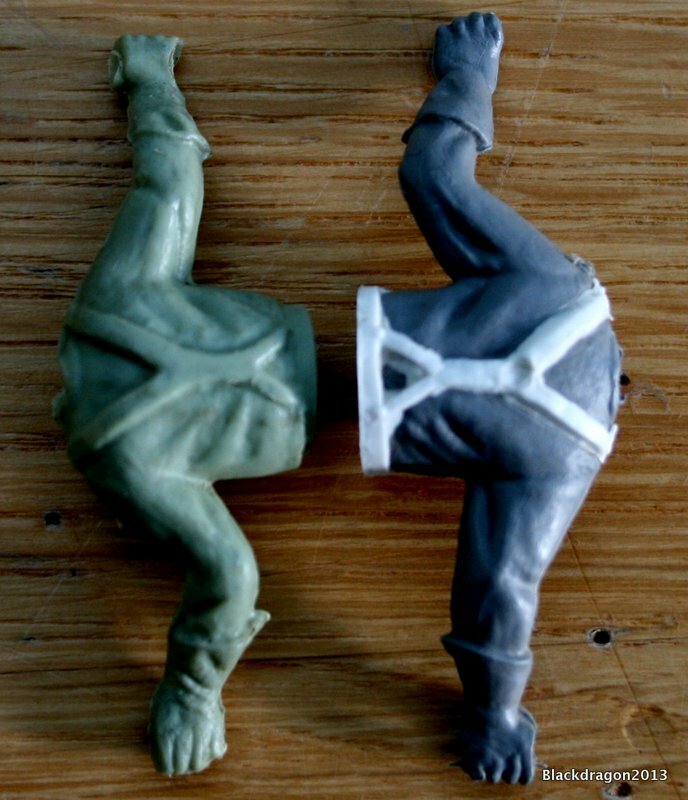 By the time the 4th Series were being made the moulding techniques had reached new heights but some of the figures became so complex that it was inevitable that some would come out faulty and as with this guy lead to an interesting piece . He has black moulding over his eyes almost like sunglasses. Also worth talking about is the Brown V Black Boots Roman Viking issue . 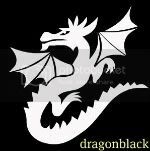 Is it Black or is it Brown … or as may be the case somewhere between . Heres a good example …… Yes the Romans boots are black but with a hint of brown ! If you have read my earlier main Timpo article link you will know that Timpo sold vast quantities of figures in Germany having a dedicated sales office in Switzerland and they remain very popular in that country. I sometimes Bid/buy rarer figures for a German friend when they are listed as UK only. I got this figure by way of payment. 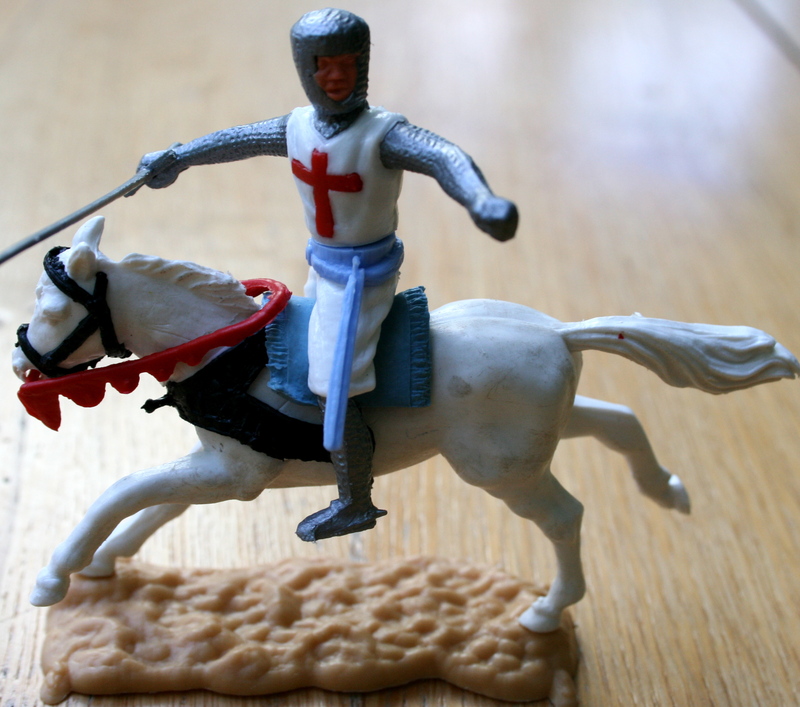 BTW the use of the term “Holy Grail” to describe plastic toy soldiers that would have cost just a few pence back in the 60’s and 70’s and were then issued in small quantities or never issued, as may be the case for the most sought after always makes me smile. Actually the definition you find in most dictionaries does work on most levels………. Article I. The definition of a holy grail is a sacred object, or something to be found or reached. An example of Holy Grail is the chalice used by Christ in the last supper. An example of Holy Grail is a sacred object you try to find that you may never locate. 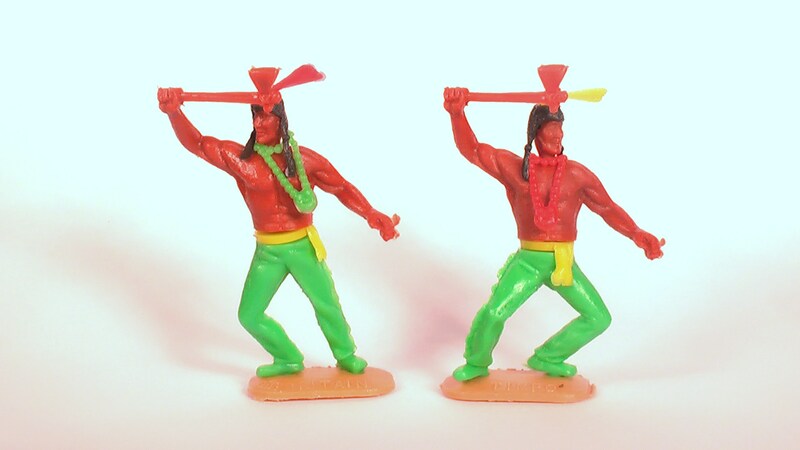 These mismold figures continue to turn up from time to time as well as the usual Knight and Cowboy rarities that seem so prized by the Timpo horde. Recently we have also seen a slow flood of New Zealand Timpo in a variety of unusual bright colours on Ebay and they have gone for some very high prices. A lot of these have been series two Indians that in standard flavours don’t have the same gravitas in the UK or Germany. It’s all in the colour you see. I’ve pinched a shot from Neville Smiths NZ Timpo site which is well worth a visit. Great figures, if only we could afford them !!! We are also seeing a growing number of people doing Timpo conversions some of which are wonderful works of art. Not for me I have to say but I do admire the effort that goes into these and I do like the golden rule that these are made only using authentic Timpo to make the conversion. Fake Timpo or conversion pretending to be the real thing can be a real pain for the collector . Here are two fake bandits to illustrate the point. These are not masks … they are have some sort of black death disease ! Last week I took delivery of a large box of figures to break up and sell on. Over 200-300 figures. The usual early seventies mix of Britain’s, cherilea , crescent , lone star , Airfix and a touch of HK plus a few Timpo knights, Cowboys , Indians , British WW2 , 7th cav and a few confederates. While sorting them I came across a body section I initially thought was from a lone star swoppet Cowboy but on closer inspection it was clearly a 7th cav/confederate body just moulded in light green, the figure being the flag bearer pose. The braces were clearly moulded correctly as were the gloves and collar. After some further investigation I realised this was a figure described in other blogs as part of a set of ACW confederates made by Charbens which are not just copies of Timpo but are clearly direct copies and in Green rather than the usual grey . The Union figures are in Blue. This made me wonder whether Charbens had actually made it or had got timpo to bung a few thousand through the moulds in a single colour . We know that these companies copied each other and sculptors moved from one maker to another . I guess we will never know for sure but if you look closely at the comparisons below you will see that they are slightly different so came from different moulds . I wondered what they would be worth if they were Timpo made for Charbens . 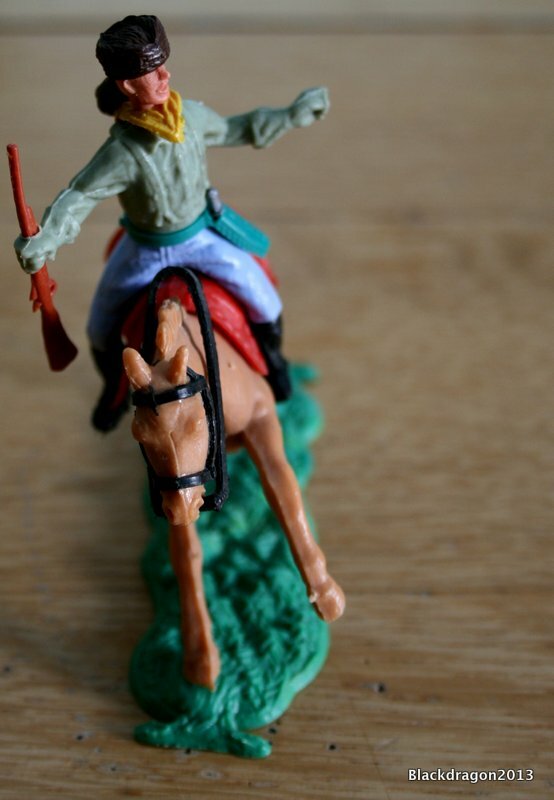 When writing this article it prompted me to pick up my Plastic warrior Charbens special to see if I had missed some key information but it still remains a bit of a mystery particularly given that Charbens swoppet cowboys are very different. I’m sure someone far more informed than me does knows about this . If you do post a response and we might be better informed. 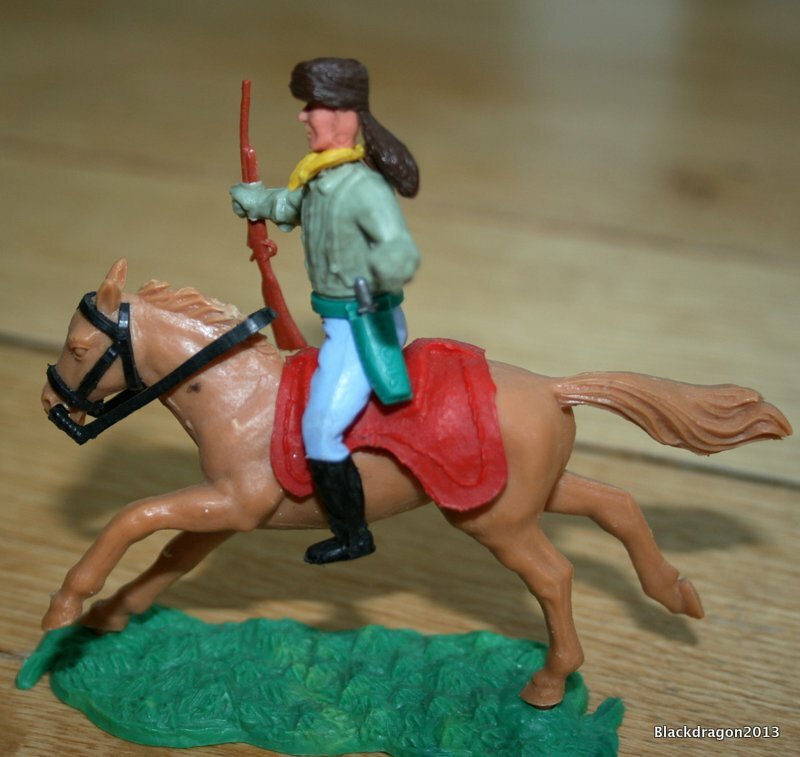 Here is a detailed look at the figure, some comparisons with a real Timpo Confederate in the same pose and in his glory with 7th Cav legs, a nice horse and a fur hat operating as a 7th cav trapper/guide. 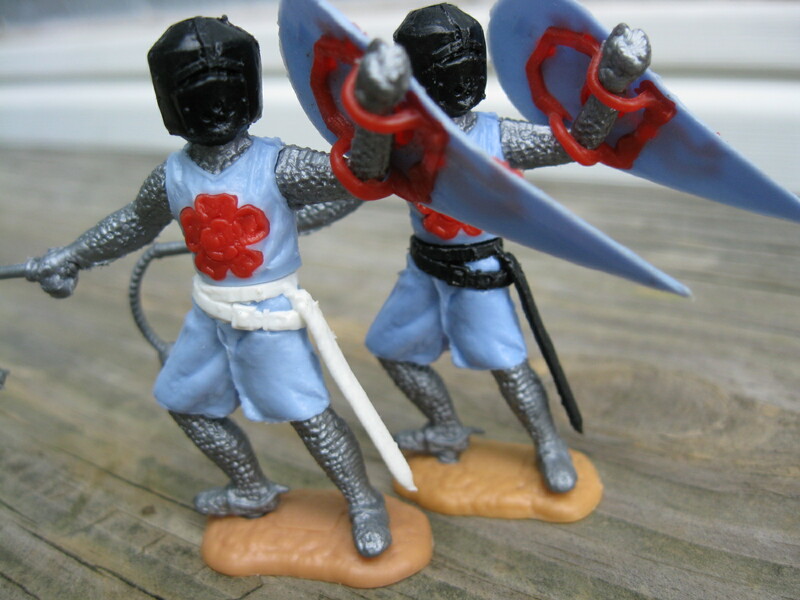 This entry was posted in Charbens, Collectables, Timpo and tagged Charbens, holy grail, Plastic Collectables, Plastic Figures, Timpo, Timpo Knights, Toy Soldiers and Figures, Vintage Figures. Bookmark the permalink. 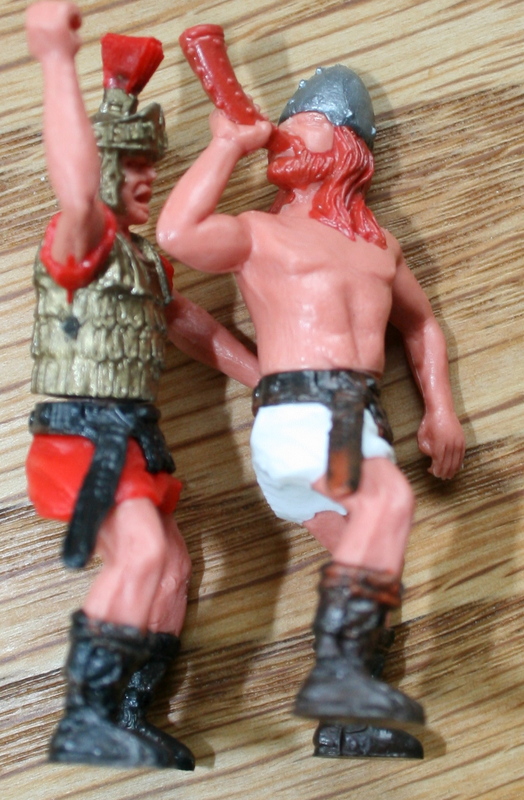 I bought a timpo Roman with black boots on ebay which just arrived. When I turn it upside down I notice the bottom of the pegs protruding through the stand are brown? Anyone know if this is normal or indicates a fake? I think when you say fake you mean are they really black boots or are they brown boots that have been coloured at some time which would make them a conversion as opposed to a fake.I assume you are satified that the leg section is made by Timpo. I have seen the black boots with some brown markings in them at the top but clearly the acid test is whether they are moulded in the colour or painted . You should be able to investigate this with a good magnifying glass. If the main part of the boot is moulded in black plastic and no one will see the underside of the base anyway then this guy would be a good addition to your collection. Perhaps the seller may be able to throw more light on it. If you want to send me a photo I will post it on this blog to get you some more viewpoints. Good Luck. If you enjoyed the article plaese sign up to follow and you can get emails with the latest posts direct to your inbox. Thanks for the reply. I chipped off a piece of paint and saw that the boots had been painted.They are the regular brown underneath. Hi, about thirty years ago I bought a job lot of several thousand Charbens figures which had been made by PRINDUS (Prison Industries) who had acquired the moulds and were using them to teach work skills to the inmates. I still have a few hundred! 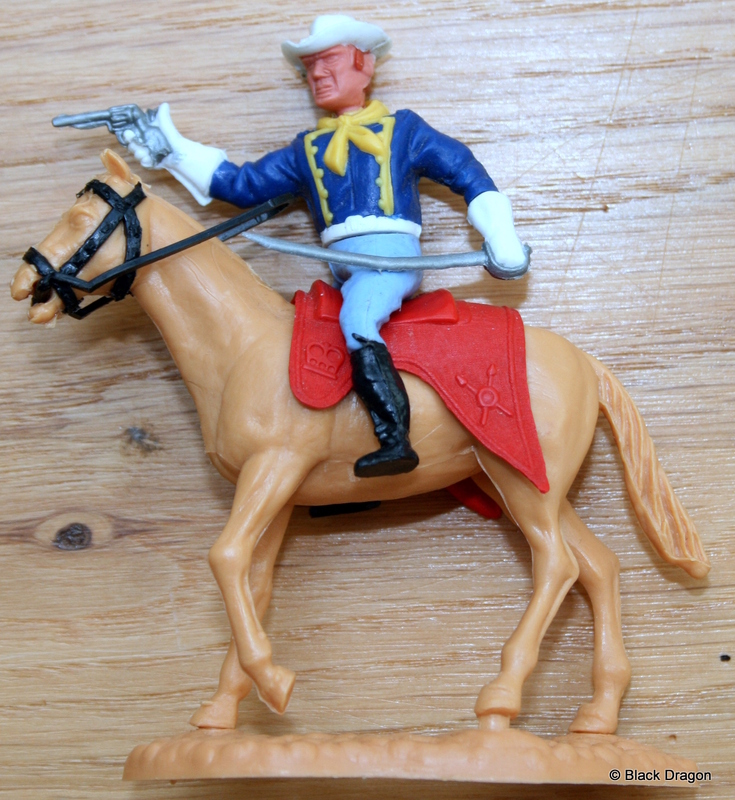 about 80% of the figures were swoppet cowboys and indians, including various poses of the 7th Cavalry bodies in both blue and this greenish gray like you have here but they are all attached to cowboy legs and heads not 7th Cav. ones. 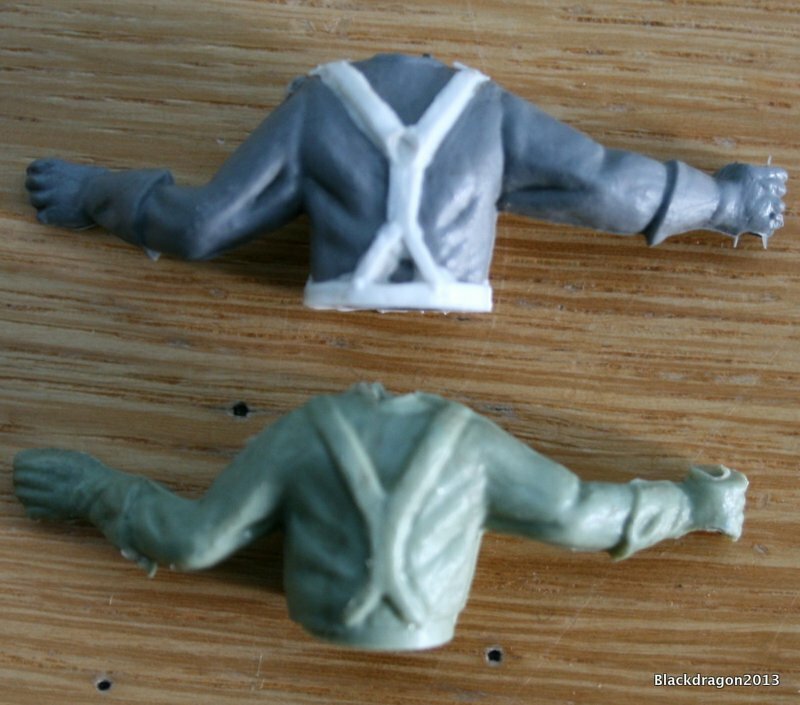 It looks like they were making additional cowboy poses, given that PRINDUS were using them for educational purposes I don’t imagine they were too picky about product accuracy and the quality of the mouldings are so inferior to Timpo that they must certainly have been from copy moulds. Hope this helps. 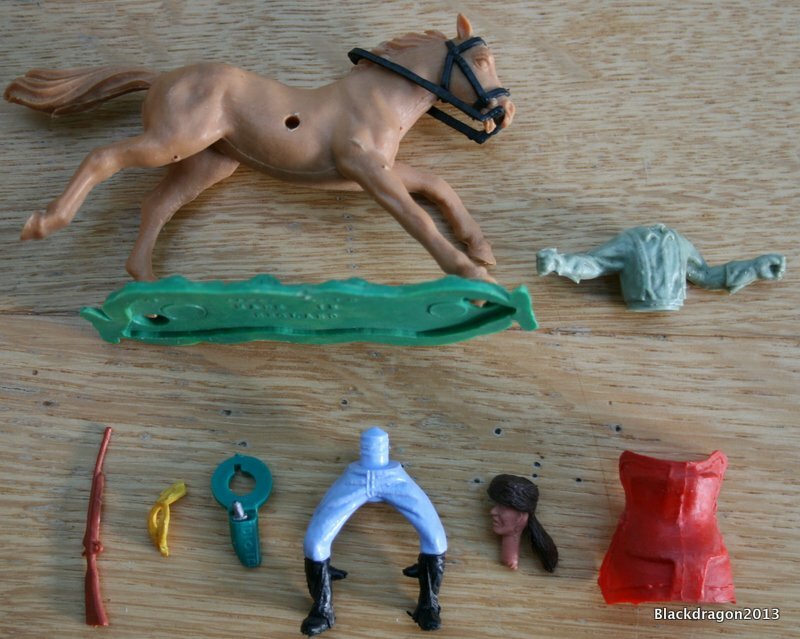 Back in the 70s I bought several Timpo Swoppets, mostly to get the horses. After reading your article, I went back to look at the toys. I couldn’t find all of the ones I remember. At one time I must have had 5 knights but now can find only 2 and one is missing the lower part of his right leg. What I’d like to know is if there is anyone interested in buying most of my Timpo Swoppets and parts. I don’t collect them anymore. hello jennifer . send me a photograph of what you have . you can text me the pic on 077789515723 and i’ll let you know.